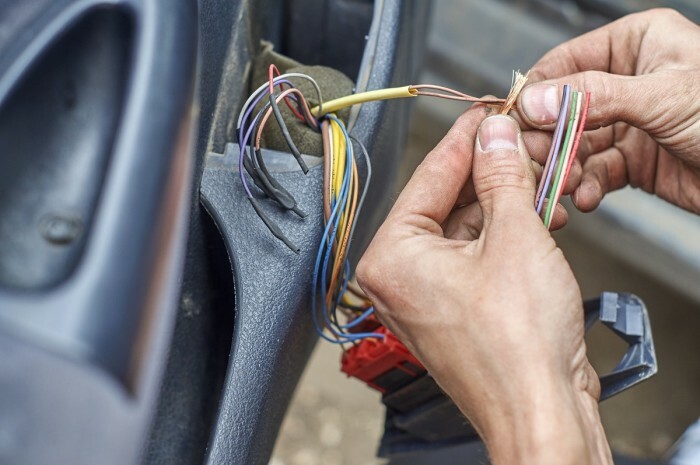 Automotive electricians install, maintain and repair electrical wiring, parts and electrical and electronic systems in vehicles. Chances of getting a job as an automotive electrician are good due to a shortage of workers. Pay for automotive technicians varies depending on experience, the type of vehicle they specialise in, and the region they work in. Automotive electricans with no formal qualification usually earn between minimum wage and $24 an hour. Qualified automotive electricians usually earn between $24 and $40 an hour. Senior automotive electricians, or those working in supervisory positions, can earn up to $44 an hour. Source: MTA, 'Repairer Salary and Wage Survey Results', 2017.
install car security and entertainment systems. may travel locally to repair vehicles that have broken down. Danielle: Hi I’m Danielle, I’m 17 and I’m from Ashburton. I'm keen to check out auto-electrical, because with modern technology and electrical in cars these days, it seems like a good career path. Clinton: Luckily for Danielle right here in Ashburton is one of the country’s busiest automotive electrical workshops. Here to show her around the job is automotive electrical technician Mike Bright. Mike: Hi, I’m Mike. I hear you’re interested in doing auto-electrical work. Mike: Would you like to come inside and I’ll show you what it’s all about? Mike: What we do basically is just to repair, service and maintain electrical systems on vehicles. We cover agricultural equipment, trucks and buses, cars, motorbikes. We get ride-on mowers here and four-wheel drive vehicles. Mike: OK we’re out in the yard here, and one of the first jobs we’ll get you to do is finish installing this speaker here on this sound system. But before we do that, we need to get you into your safety overalls. There you go. Mike: The type of person that would suit working in this industry really needs to be self-motivated, needs to be keen and they need to have an actual interest in the industry. A good practical outlook is helpful. Mike: OK, looking good! Righty-ho, first up then, what I need you to do is to clamp these wires into the back of this speaker here. So the red one goes into the plus there, and the black one goes into the minus there. There you go, there’s a screwdriver. Mike: Yep, and then just put it back into the hole there. Clinton: With the speaker installed, it’s time to test the sound system. Mike: Sounds good to me – job well done! Mike: On to the next one! Mike: OK, this is brand new-built bus, we’re going to go out and road test it. We need to check certain parameters are working correctly. This is Serge, he’s going to be our driver today. Clinton: But before they can head off on the road there’s a faulty door to be fixed, so Mike sets up the laptop to diagnose the source of the problem. Mike: OK, so we’ve got the laptop hooked up to the body control modules, so we just need to check what inputs and outputs we’ve got there to see why the doors aren’t opening. This gives us a list of all our inputs and outputs. So when they’re white, that means they’re switched on, and when they’re black, that means they’re switched off. Now one thing that I have noticed here, is that the door amp switch is not on, and if the door amp is not on, we can’t close the doors. So I'd say that our problem is in that circuit. Mike: OK first up, we need to have a look underneath and just make sure that that ramp switch is actually connected, and the wire for that is just under here, and that looks pretty good to me. Mike: So the next thing we need to do is make sure there is no dust or debris trapped underneath the ramp, so I just need to pull it over like so. Straight away we can see that there’s a stone stuck underneath the ramp. Danielle: So that’s what was stopping the doors from closing? Mike: For me what I find interesting about this job is pretty much when you turn up for work, you get given a job. Something doesn’t work, you get to play around with it, work out how it’s supposed to work and then you fix it and you send the customer away quite happy. Mike: Now the opportunities in the auto-electrical industry are endless really. After your basic apprenticeship, you can move into the air-conditioning side and become a fully qualified air-conditioning technician. You can go into first-line management, and take on a management position at the company you’re working in, or alternatively you can go and set up on your own. There’s a high demand for auto-electrical technicians. Danielle: Hi, are you Mark? Danielle: Mike told me I’m going to be working with you on some air-con. Mark: Yep, that’s right. What we’ve got here is a tractor that the air-conditioning is not working. So what we’re going to do is, we’ve got a temperature gauge here, and we’re just going to start the tractor up briefly, just to see what the temperature is coming out of these vents up here. Mark: Right. As you can see, it’s pretty warm coming out these vents. It’s not working at all. So what we’ll do next is we’ll go down and check the gauges and see what they’re reading. Mike: In this job you definitely need to be able to think outside of the square. Although the principles of how things work are pretty much the same across all the vehicles, the way in which you go about finding them, or fixing them, varies across all the different types of vehicles. Mark: So if you just shine that light around some of these connections up here and see any of that dye coming out there. Danielle: I think I’ve found something Mark. Clinton: Having located the leak in the air-conditioning system, the rubber seal is replaced and it’s all cool inside the tractor. Mike: Good subjects to study I would say would be maths, English, maybe even a science kind of qualification, some technical and definitely computer studies. Danielle: So what should it be reading? Mark: It should be about six degrees, it’s working well. Mark: Good job, well done. Mike: I thought Danielle did really well today. She was very keen and enthusiastic to learn. She followed instructions really well and she carried out all the tasks successfully, which is all we can ask. Danielle: I really enjoyed turning the tractor on with the air-con job, that was really cool. And I just think it could be a good career path for me. Clinton: A National Certificate in Automotive Electrical Engineering (Level 4) takes three to four years of on-the-job training to complete. Students can take part in a secondary school automotive training programme called StartUp, which is run by MITO and provides a pathway for students into the automotive industry. The demand for automotive electrical technicians is growing as manufacturers are installing more electronic components in new vehicles. There are no specific requirements to become an automotive electrician. However, employers usually prefer you to have a qualification and full driver's licence for the type of vehicle you are working on. Industry training organisation MITO oversees automotive electrician apprenticeships. To become a qualified automotive electrician, you need to complete an apprenticeship and gain a New Zealand Certificate in Automotive Electrical Engineering (Level 4). This was previously the National Certificate in Motor Industry (Automotive Electrical and Mechanical Engineering) (Level 4). No specific secondary education is required for this job, but NCEA Level 1 with a minimum of 12 numeracy credits and 12 literacy credits is useful. a National Certificate in Motor Industry – Foundation Skills (Level 1). Automotive electricians need to have good hand-eye co-ordination and normal colour vision. They also need to be agile and have good flexibility for working in small spaces. large roading projects and forestry operations use earthmoving and forestry equipment, trucks and other heavy vehicles, which need servicing. About 1,200 automotive electricians work in New Zealand, but this is not enough to meet demand. As a result, automotive electrician appears on Immigration New Zealand's long-term skill shortage list. This means the Government is actively encouraging skilled automotive electricians from overseas to work in New Zealand. Nearly 20% of automotive electricians are self-employed, and 14% of them own a business where they employ others. Immigration New Zealand, 'Long-term Skill Shortage List', 19 February 2018, (www.immigration.govt.nz). MITO, 'Automotive Workforce Development Strategy 2016', accessed November 2017, (www.mito.org.nz). MITO, 'Investment Plan 2015-2016', accessed November 2017, (www.mito.org.nz). Pullar-Strecker, T, 'NZ's 15,000 Motor Mechanics Get Ready for the Electric Vehicle Era', Stuff, 22 July 2016, (www.stuff.co.nz). Sustainable Business Council, 'NZ Business Pushes the Electric Vehicle Pedal', 22 August 2017, (www.sbc.org.nz). Automotive electricians may progress to set up their own automotive electrical business, or move into management, customer service, or other automotive or engineering occupations. areas such as fuel injection systems or computer repairs. Electricians install, maintain and repair electrical systems and equipment.